A huge thanks to Pergo for partnering with Domestically Speaking in our flooring makeover. I’ve been so excited to share with you our finished flooring project! This has been a big undertaking as we replaced all our downstairs flooring… but it has been SO worth it. Since we moved into our home 9+ years ago I’ve been wanting to rip out our old carpet, linoleum and tile. It’s absolutely amazing what a difference new flooring makes in a space. We decided to go with Pergo Outlast+ laminate flooring for a few reasons. First I loved that it was 24-hour water resistant which is a hugely important factor when you have 3 kiddos. Second I loved how it looked. You can check out my post from a few weeks ago when I talked about how we picked this flooring and how we installed it. But I truly fell in love with the Vintage Tobacco Oak. I love the variation of color tones in the planks and I love how it went with gray, since we have a lot of gray tones in our downstairs. I love that the wood has a little rustic vibe to it with the grain and distressed grooves in it. We didn’t even need to remove our baseboards for installation. Pergo has perfectly matching quarter round. You just install the quarter round to cover the expansion gap you place around the room and your edges are beautifully finished. What a difference! The whole downstairs has a whole different feel! I’m super excited to tackle my office space. We’re turning our formal dining room (which had become a dumping ground) into my office. I’m hoping to get it tackled in the next few weeks, so stay tuned… but the floors in here are looking gorgeous! I hope you enjoyed checking out our new flooring as much as I’m loving it. It definitely was a big DIY project, but it’s been worth all the time it’s taken. A big thanks to Pergo for partnering with me on our new flooring. As always all opinions expressed are my own. utilized an additional vapor barrier? Thank you for the great pictures and any information you can share!! Would you please talk about your choice of quarter round? I noticed in the photos you used white and brown with this flooring. I can only use one with my floor. Any thoughts? Sure! So we decided to no remove our baseboards while installing our flooring. We did this for a couple reasons, but mainly to save money and time. So the baseboards stayed on while we installed. The quarter round trim we used is from Pergo and matches our flooring perfectly. The 1/4 round also hides the spacing that you leave for expansion around the edges of the room. I hope that helps?? 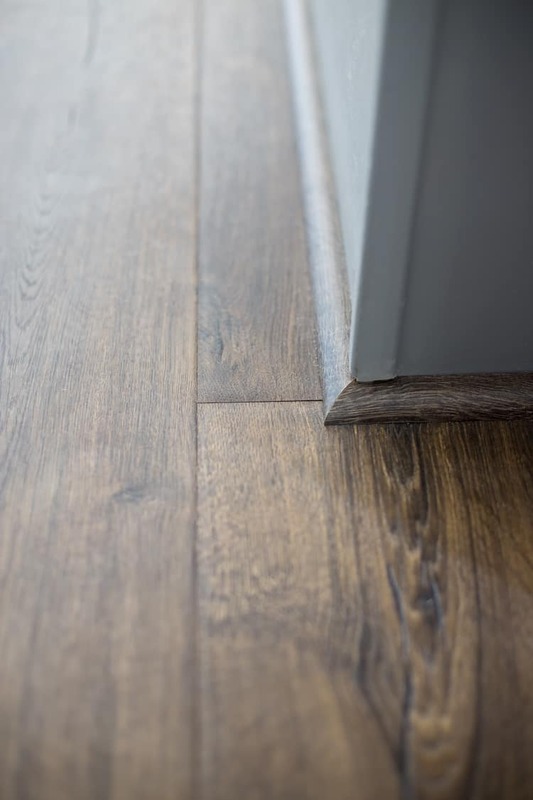 If you were only picking one, most would remove baseboards (if installed) – lay flooring and then put back on baseboards to hide the spacing you leave between the flooring and the wall. Can you tell me how the floors have held up? They look beautiful, though I’m a little worried about the difference in the color in your home and the color sample at Home Depot it online! It looks so dark! I hadn’t even considered it until I saw it in your home! I just thought it was too dark, but it is gorgeous! Thank you for your time! Hi Denise! They are holding up beautifully & I still love them! I’d say they are in the medium-dark tones. There’s quite of bit of variation in tones so I don’t think it’s too dark (like a single shade plank might have). Denise, I think the lighting in the space also makes a difference! We are installing the Auburn Scraped Oak in our house right now, and it almost looks more like this one that Domestically Speaking is featuring. Whereas online the photos of the Auburn look very red. As much of a pain it can be, I would recommend buying a box and grabbing a few pieces and laying it in different areas of the room you’re looking to redo to get a real idea of what your floors may look like! We had issues with color when trying to paint our interior spaces grey, every grey paint I brought home looked blue, so we actually used a beige and it totally looks grey! Lighting plays a huge part in interiors. How have your floors held up? We have two dogs and want something durable. They are holding up wonderfully! We’ve got 3 kiddos and a psycho cat that loves to run laps downstairs. The floors look gorgeous here and I am in love with the light gray walls and white trim. Any chance you know what paint color you used? It’s a great match! Thank you! Kirstie it’s Sherwin Williams Knitting Needle – LOVE it! Do you have any hallways or spaces that are less than 4ft wide. We were told by installer that there had to be a transition type piece any place the span was less than 4ft. according to Pergos warranty. We had our hearts set on this product, but that would really break up the flowing look I was going for. How did you handle this? That’s a personal preference. We put transitional pieces, but my brother is a contractor and I know people don’t very often. Yes, if there’s an issue it will be a problem with warranty though. The flooring in our prior home was almost a chocolate brown and while I was looking for that, I came across the vintage oak color and texture and can see it as a real possibility. In your pictures it looks very light compared to the Home Depot picture. Considering we are coming from quite a dark brown color, do you think this would be considered light or medium? Your pictures are beautiful! I’d say they are a medium to medium-dark tones. There’s definitely variations of colors in each plank. What color cabinets do you think the vintage oak would go with beside white? Gray is a neutral, virtually any color you could think of. I would choose in the cool tones such as bluegray or a dove gray. I love the wall color. Do you remember what the name of it was? Michelle the gray is a Sherwin Williams Knitting Needle. Hi Nicole – that was one thing I was worried about with darker floors. I haven’t noticed that being an issue at all. I think the variations in the wood tones help hide things well. Beautiful floors and you have a very beautiful home, We’re probably going to do this flooring in our home soon! I love your rug and that’s the look I’m wanting for our living. Do you remember where you got the rug? Amanda I found it at Ross. Is there a brand listed? I looove the floors and the rug :). Doing this in my basement in spring!! Beautiful floors. Thank you for linking with us at #HomeMattersParty . We would love to have you again next week. These floors look absolutely amazing!